Strategic use of ever unpredictable financial resources. Lean yet nimble teams, structured to facilitate overall achievement of goals. Collaborations that prioritise knowledge, learning, and making interventions. An encouraging sector environment. Trust, transparency and communication among all stakeholders. These are necessary elements in commonly-held visions of effective social impact and philanthropy sectors, that utilise their shrinking resources well, proactively engage with their social, political and economic world and constantly innovate. The reality of India's social impact and philanthropy sectors, however, could not be further removed from this vision. Stuck in the pressures of sheer survival, saddled with a complex regulatory landscape and a challenging socio-political context, our vision for the social impact and philanthropy sectors has become a receding horizon, instead of a guiding compass. 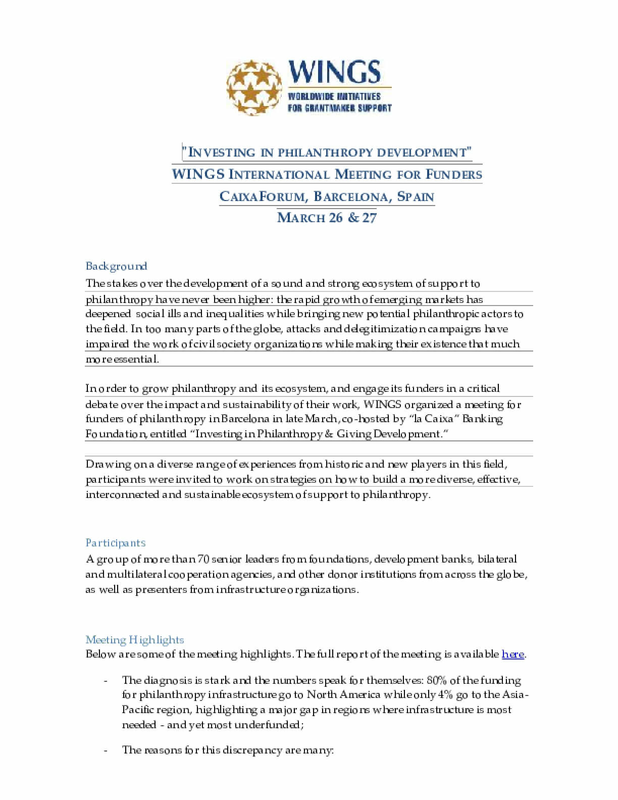 From a description of various forms of individual giving to the growing importance of community philanthropy and structured, institutional giving, the current report is an effort to bring back the diversity of the field of philanthropy at the center of the debate, by drawing a comprehensive and provocative picture of current trends and challenges of the field. 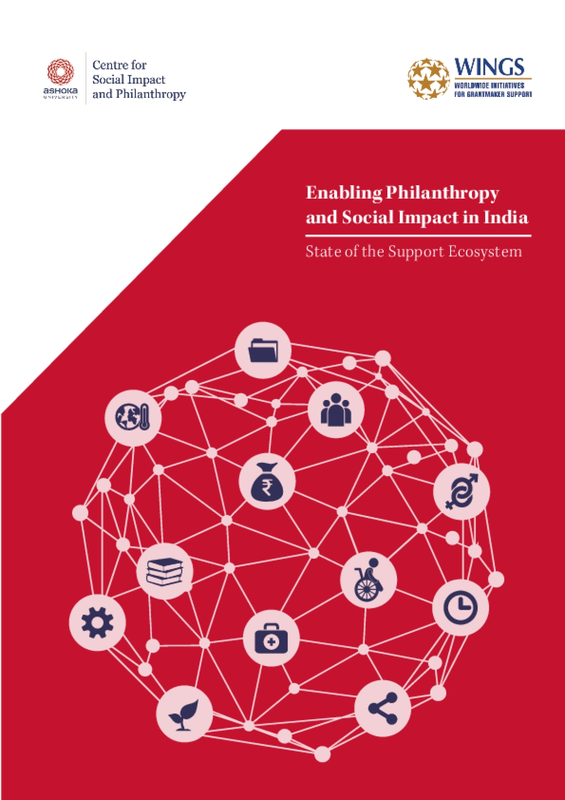 The report also raises some of the questions and issues most critical and central to its development – from technology and shrinking civic space to power dynamics within philanthropy practice and concepts, to the evolving role and form of philanthropy infrastructure. 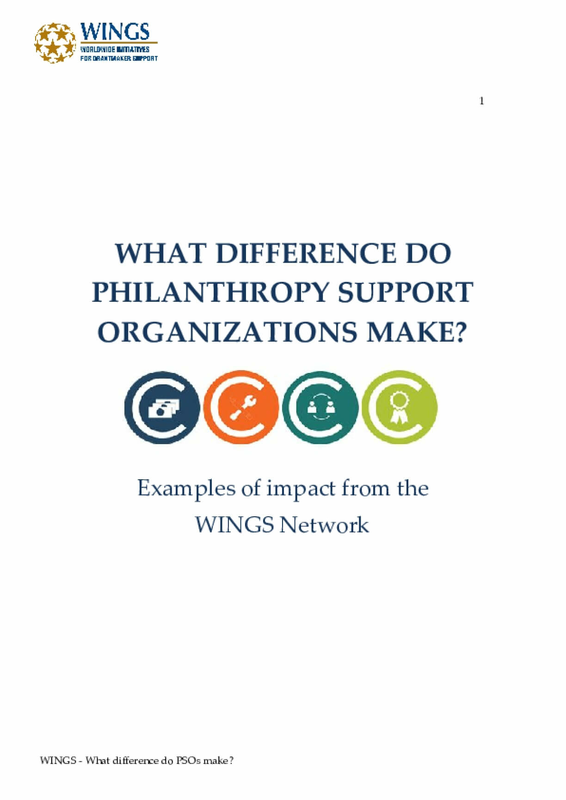 Worldwide Initiatives for Grantmaker Support (WINGS) is a network of close to 100 philanthropy associations and support organizations in 40 countries around the world whose purpose is to strengthen, promote and provide leadership on the development of philanthropy and social investment. 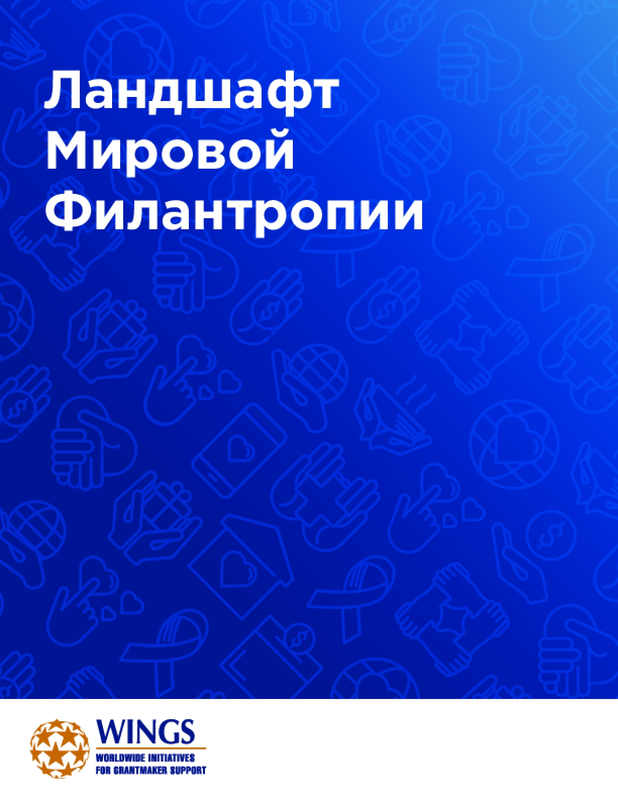 It provides an indispensable platform for convening, connecting, knowledge sharing, peer learning and collaboration among a growing membership that represents philanthropy and private social investment in every region of the world. What difference do PSOs make? "What difference do you make?" is a challenging question to answer for philanthropy support organizations (PSOs). Assessing the impact of this field is complex because much of the support is not always tangible as it often relates to processes and relationships. Positive results also often appear on the long term and can hardly be directly attributed to one single actor or initiative. As a result much of this invisible work is undervalued and our field lacks references to improve its own impact. WINGS started gathering concrete examples of achievements from the field. This document provides a synthesis of a first series of 8 impact stories shared by our members and which illustrate the diversity and importance of their contribution to the development of philanthropy. The cases are presented following the 4Cs assessment framework: capacity, capability, connection, and credibility- with all their respectively outcome areas- were applied to highlight key achievements presented by each case. These cases were initially selected for and presented at WINGS International Meeting for Funders of Infrastructure in Barcelona in March 2018. 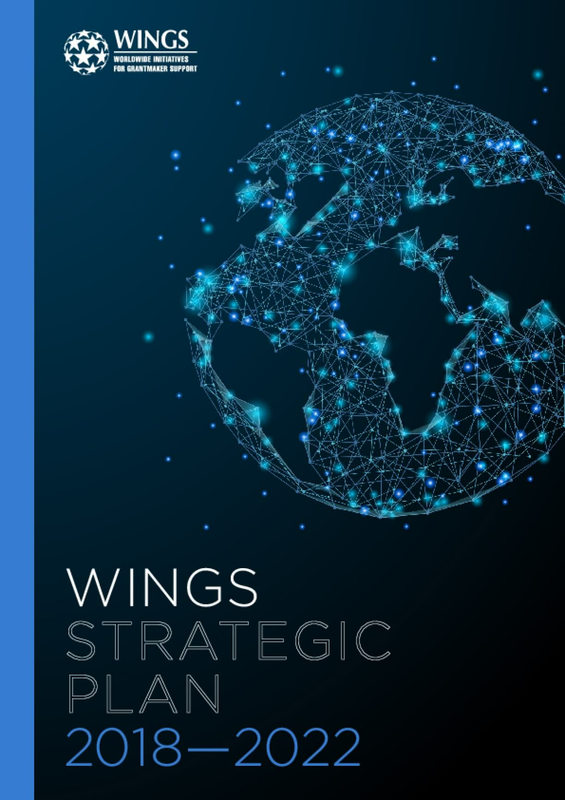 This paper sets out WINGS' strategic priorities for 2018-2022. These priorities stem in large part from an analysis by WINGS of trends both in the world generally and in philanthropy in particular. 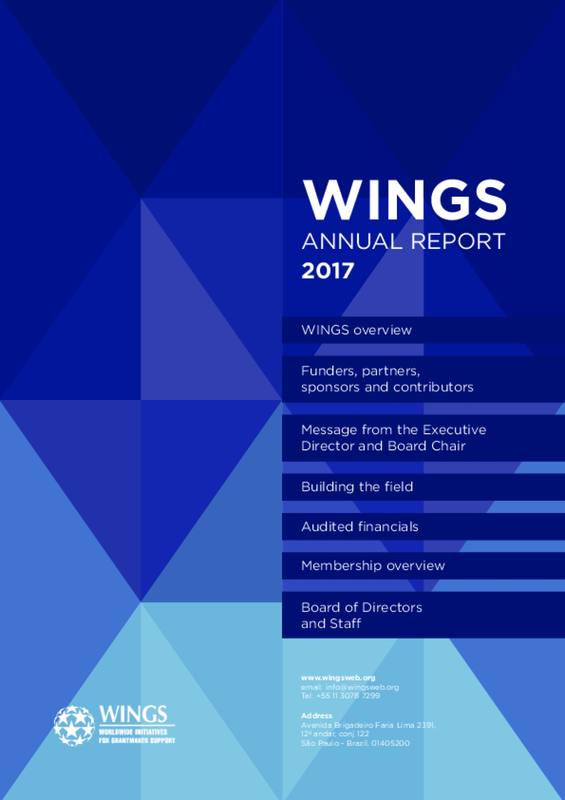 At the same time WINGS remains fully committed to the ongoing activities that are part of its core mission, as detailed below. This guide is for all funders who wish to understand how they can contribute to unlocking philanthropy's potential to build more resilient, sustainable and democratic societies. This is what the philanthropy support ecosystem, also called philanthropy infrastructure, isall about. It is about developing and harnessing private resources for social good, building civil society and democracy, and helping to achieve the Sustainable Development Goals (SDGs). It is central to the mission of all visionary funders who want to increase the impact and sustainability of their work. Meeting notes, long form, from the Barcelona Funders Meeting in March 2018. The stakes over the development of a sound and strong system to support and develop philanthropy have never been higher. In many regions the infrastructure is still emerging and needs to be strengthened and where it is well developed it often faces challenges of sustainability and duplications. This paper, published by WINGS, provides information and key messages to guide the reflections of funders, philanthropy support leaders and other actors, in developing their infrastructure and turning it into a proper ecosytem. 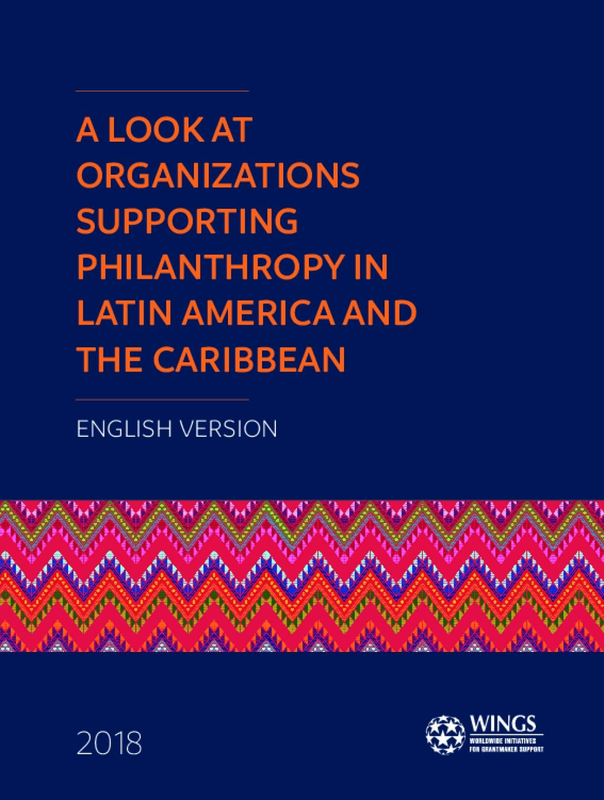 It gives a picture of organizations, functions and activities that are needed for philanthropy infrastructure to play its role unleashing the potential of philanthropy and calls for a new paradigm of collaboration within the field. More than a publication, it is a step in a long-term process of reflection and action to develop a strong and interconnected global ecosystem of support to philanthropy. 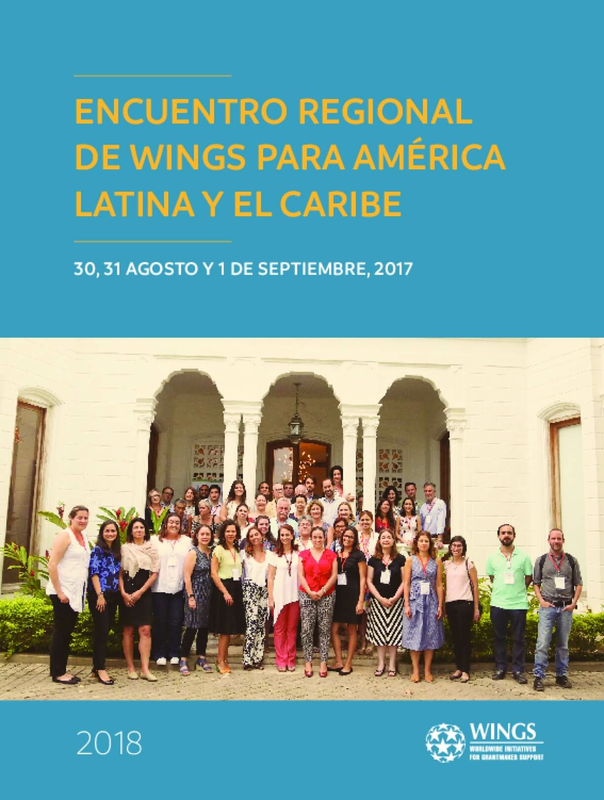 On August 30, 31 and September 1, 2017, over 50 people from 10 countries met at the CasaFundación Surtigas in Cartagena, Colombia, representing the philanthropy sector, foundationsand international cooperation; private and banking sectors and social responsibility; andalso the sector of social development and innovation, to participate in the WINGS RegionalMeeting for Latin America and the Caribbean, to exchange experiences and contribute avision on philanthropy in Latin America and the CaribbeanWith three (3) main objectives, the Meeting helped to identify the main characteristics of thephilanthropic practice as well as opportunities, weaknesses and possible roadmaps:1. 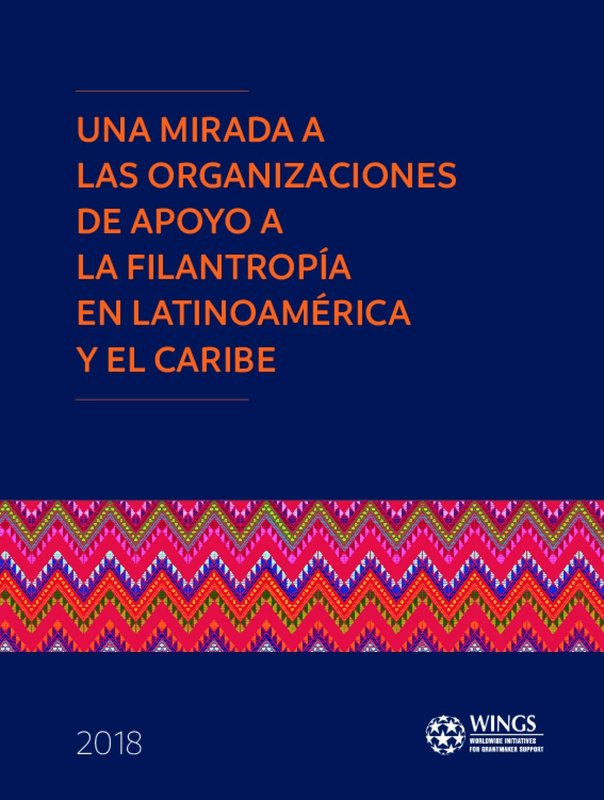 Create a shared understanding of the Latin American philanthropy and social investmentcontext2. Contribute to a common vision of the needs and potential in topics for exchanges andcollaboration3. Identify key topics and contribute to a roadmap to increase collaboration for philanthropyinfrastructure in Latin America and the CaribbeanThis document presents the topics that were debated during each session, the main elementsconsidered by participants and the key issues that came up in the exchange in subgroups andplenary sessions. Versions of this report are available in Spanish and English.